Winter is coming. Is your pool slide ready for the freeze? 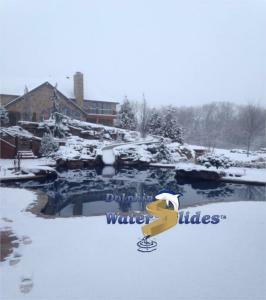 | Dolphin Waterslides, Inc.
Winter is well on its way, so right now is the time to prepare your pool’s plumbing for the dropping temperatures. The fall is the best time to winterize your family pool and accessories. Be sure to include your pool slide as part of the pool closing. Don’t let this winter wonderland become a Spring sabotage. Take a couple of simple steps now to save you and your checkbook later. Why should I worry about winterizing my slide? This Blog Post from In The Swim takes a serious look at the damage that can be done to your pool and your wallet if you don’t properly winterize your pool. The same goes for your water slide. Once frozen, water left sitting in the lines can expand up to 10%. You know what this will mean next Spring when you start filling everything up again if you left your lines full over the winter. Your water slide from Dolphin will be plumbed with 3/4″ up to 2″ water supply lines. You may have one or two of these on your slide. Just like the lines in the pool from the skimmer, the pump, and the other features, you may have; these lines will need to be winterized by removing all of the water you can from the pipes. How should I remove the water? Experts suggest you use a shop vac rather than an air compressor to accomplish this. A shop vac has a high volume of air, but lower pressure to reduce the chance of damage to the lines, the fittings, or valves. 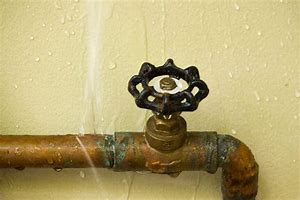 Once the valves are opened on the pump, hold the vac at the water inlet on the slide entry and push the water out until you see the air bubbles forming at the pool return. Once the line is clear of water, you may plug the jet on the entry to stop any water from entering the lines through the jet on the slide. Now the water is out, what’s next? Now is also the time to clean the slide, perform any maintenance or repairs that need to be done, and protect it for the winter months using a UV inhibitor and a very good waxing, taking additional time on handrails and entry area that don’t receive as much moisture from sliding over the warm months; or any area that are showing signs of wear.